and access insurance related activities from claim processing to settlement is a boon to insurance industry. 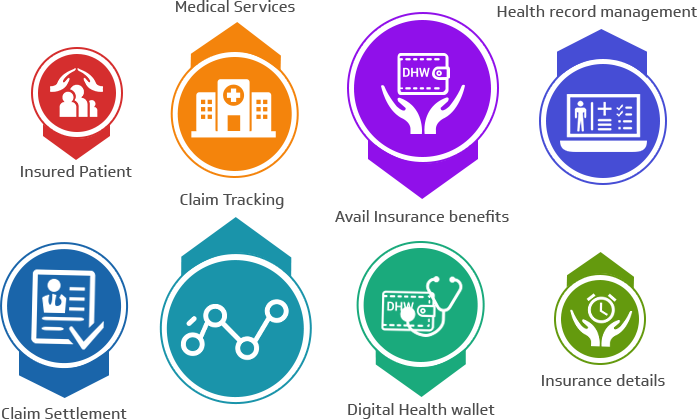 Healthcare provider like hospitals and insurance company can provide digital health wallet to patients with all medical details integrated with hospital information management system and insurance management system. Digital Health wallet will allow patients to avail facility provided by insurance thru its unique identification and can submit claims and track the status whereas insurance company can get analytics in the form of interactive dashboards to have comprehensive picture. Unique Digital Health account for each policy holder with complete medical record from empanelled hospitals. Patient can avail insurance facility from health care provider with its unique account Id. Integrate with existing system like ERP or CRM or claim management software and give data unification and standardization to give comprehensive picture. User can view and track the status of claims and perform secure communication with claim handlers. Better insight about enterprise performance.